That should give you an idea of what movie you’re in for – Lots of cheesy one-liners from Arnold, set in a dystopian future envisioned by the 1980s, with all the flashy neon colors and rummaging through the streets that you would expect. As such, its difficult to take this movie seriously. “The Running Man” wants to give you a look at a future where the government uses television to keep us under control, and one where we watch people fight to the death for our amusement. But then almost all Arnold’s lines are laughably corny that I am unsure what they movie is going for. The best part of the movie was certainly the host of the Running Man game show, Damon Killian, played by Richard Dawson, one of the first hosts for “Family Feud” and a number of game shows from the 1960s and 1970s. He maintains his usual charisma from those shows, where he wasn’t afraid to question the audiences’ intelligence, but we also get an added level of absurdity when we find out how vulgar and diabolical he is, not afraid to fire people who run into him in the hallway and blackmailing others to do his will. Overall, “The Running Man” stands out-do to Richard Dawson’s performance and having so many quotable moments for Arnold. Outside of that, this is a standard 1980s dystopian future sci-fi movies, like “Escape From New York,” and doesn’t do too much to stand out from that. This is one of my guilty pleasure movies. I actually just watched it a few weeks ago. Some of the elements have not aged well but overall it’s still a hugely entertaining movie and Killian is a superb “baddie”. In fact, it’s Dawson’s performance that I enjoy most these days. Nice review. It’s still a pretty solid movie, all of these years later. 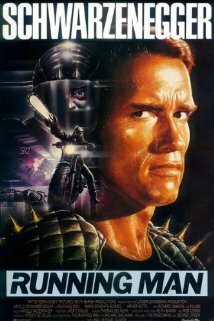 I was (and am) a huge Schwarzenegger fan, but to this day I don’t understand how his glut of 80s action movies got made. Most are pretty terrible. It’s almost as if they were made for 13-year-olds like myself – cardboard characters, ridiculous plots, graphic violence, and cheesy one liners. Not that I’m putting them down as I still love them. (They’re just a pleasure for me, not even a guilty one). Too bad the action movie landscape changed and Schwarzenegger couldn’t change with it. I wish he did more these days than the occasional Terminator cameo.